Hillary Clinton held a press conference to discuss the email controversy but wound up stonewalling and creating even more questions. The news conference was basically an expanded version of her tweet, just as misleading and reveling little actual information. Considering the Nixonian feel to this scandal, I was waiting for someone to ask if, besides whether Hillary will be keeping her private server, whether Chelsea will keep Checkers. There are so many problems with this response, besides the obvious of violating the rules based upon convenience. Phones were able to handle multiple email accounts, so there might not have been a need to carry more than one device. If her preferred device could not handle more than one, what is the big deal about carrying more than one? Before smart phones got to their current state, I generally carried two, and sometimes three, devices to handle my professional and personal communication. Today she said she didn’t want to carry two phones but in recent interviews she has stated she uses two phones, and has also discussed the large purse she carries–large enough for all the phones and electronic devices she needs. Her comments on convenience also suggest that Clinton might have wanted to continue to use the email system she was accustomed to, rather than changing to a government system as Obama did when he took office. However, hacked email has demonstrated that the domain she used was not set up until January 13, 2009–one week before she took office and the day her Senate confirmation hearings began. How was it more convenient to set up her own domain as opposed to using a government email address? What about the minority which weren’t sent to the State Department? We know for a fact that Clinton discussed government matters with people who weren’t even in government at the time as a result of Sydney Blumenthal’s email being hacked. It will be interesting to see if this email is included in the email she ultimately sent to the State Department. She did not release the email until well after she left office in response to demands. 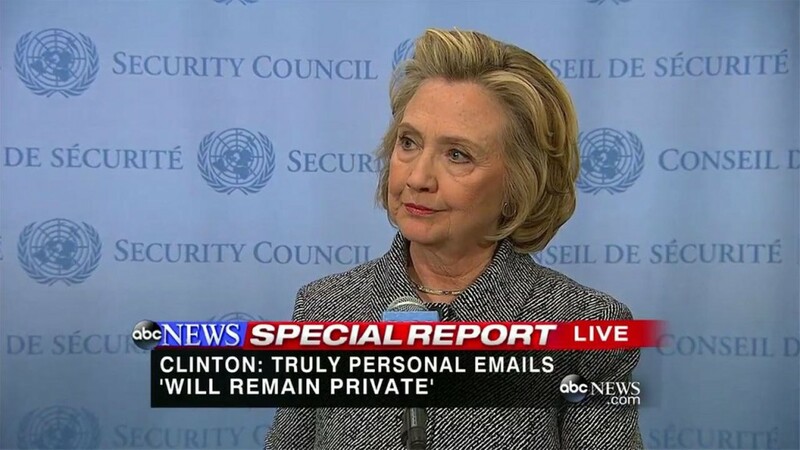 She failed to release all the email and refuses to have an independent source judge which is personal and which should be preserved on government servers. In the meantime, she has used her private servers to fail to respond to Freedom of Information Act requests and requests from Congress for her email. Her elaboration on personal email while answering questions raised another red flag. She spoke of email with her husband. It sounds reasonable that she might not want personal email with her husband released–until you read that Bill Clinton has only sent two emails in his entire life, and none since leaving office. A minor point compared to many of her other comments, but while she talks about the public seeing her email, it will be quite some time before her email goes through the screening process and is really available to the public. Again, only the email she selected to release will be reviewed for eventual release to the public. THE FACTS: At the very least, Clinton appears to have violated what the White House has called “very specific guidance” that officials should use government email to conduct business. Even if Clinton’s defenders were right that she did not violate any rules, her conduct was clearly both unethical and foolish, contributing to the reputation of the Clintons for opposing transparency and believing that different rules apply to them than to others. The assertion fits with the facts as known but skirts the issue of exchanging information in a private account that, while falling below the level of classified, is still sensitive. Plus we can never be certain of the facts when Clinton decided which email would be sent to the State Department and which would remain on her private server or be destroyed. She was somewhat contradictory on this point, but it appears that she did destroy tens of thousands of email. THE FACTS: While Clinton’s server was physically guarded by the Secret Service, she provided no evidence it hadn’t been compromised by hackers or foreign adversaries. She also didn’t detail who administered the email system, if it received appropriate software security updates, or if it was monitored routinely for unauthorized access. Clinton also didn’t answer whether the homebrew computer system on her property had the same level of safeguards provided at professional data facilities, such as regulated temperatures, offsite backups, generators in case of power outages and fire-suppression systems. It was unclear what, if any, encryption software Clinton’s server may have used to communicate with U.S. government email accounts. Vox has more on the security questions, along with a good summary of the controversy prior to the press conference. This is unlikely to be the deciding issue in the election, especially considering that so many Republicans also have issues with private email. The significance is more in how Hillary Clinton responded to the first major controversy of her soon-to-be announced campaign. I’m sure her supporters bought every word, but others will question her claims that she used a personal server for convenience as opposed to avoiding scrutiny. It is especially difficult to believe Clinton considering she has already used her private servers to avoid Freedom of Information Act requests. She is asking Americans to trust her while preventing any verification in destroying email, and refusing any independent review of the email she did not turn over to the State Department. If Clinton handled this crisis so poorly, will she self-destruct during a presidential campaign? At this point I don’t believe that any other candidate can stop Hillary Clinton, but Hillary Milhouse Clinton sure might stop herself. At least she self-destructed during the primaries in 2008, leading to the nomination and election of Barack Obama. As she is likely to win the Democratic nomination in 2016 with only token opposition, this time many Democrats fear (and Republicans hope) her self-destruction will lead to a Republican victory in 2016.